Welcome to Rocky and Roxy - inspired by two rescue dogs who wanted to sell personalised products for PETS and PEOPLE. 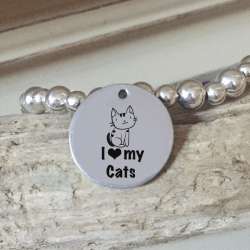 They hope you find some inspiration here for your perfect item we have for People - bracelets, necklaces & keyring and for Pets - Dog or Cat ID Tags or Dog Necklaces. We have designed an easy way to order your own creations - type in your words, upload designs/images or choose from our designs. A colourful and fun range of affordable jewellery just browse our collection of ready made ones or design your own. Each is handmade and bespoke, we use mainly Sterling Silver, Silver Plated, and semi precious stones. Everything is made to order therefore we can tweak the designs to anything you would prefer..! Step 2 - Engravable products - to choose your personalised disc from our own designs or make your own..! The stainless steel discs will not tarnish or oxidise are hard-wearing and Hypoallergenic. We use the latest etching technology that gives black words/images that bond onto the surface therefore the message or image can be clearly seen unlike traditional engraving. FREE SHIPPING in UK, Europe £10, Worldwide £12.